SeeShell is one of many sustainable brands created by DW Fine Pack Inc. Fine Pack is a well known manufacturer of high quality food packaging products. The products are great for restaurants, grocery stores, and more. SeeShell producs were designed and created with a commitment to the environment. DW Fine Pack introduced a new type of disposable products with SeeShell and three other brands. These products are made using a biopolymer that is 100% renewable. This biopolymer is calledNatureWorks® Ingeo™. Seal in flavor and freshness with DW Fine Pack’s most versatile clamshell package, SeeShell™. It’s beauty, durability and functionality provides a superior solution for your savory creations. And the unique SeeShell™ continuous contact seal keeps moisture in and air out — locking in freshness for longer shelf life. 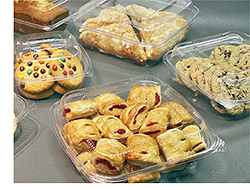 Made from a NaturesPLAstic® (Ingeo™ biopolymer) blend, SeeShell™ comes in a variety of sizes for fresh deli and bakery items, with one piece hinged construction that reduces inventories, requiring less SKUs. SeeShell™ hinged containers are stackable, and feature crystal clarity construction to maximize merchandising appeal.